Multi-purpose heavy lifter. The attenuators reduce level, audio or CV, when switch is set to off. With the switch up the audio/signal passes through at full level. The inputs are linked together: patching into channel 1 drives both attenuators; patching into channel 2 breaks the link. Experimentation with key tracking to create alternative tunings, or interaction with audio inputs that don't afford attenuation—does good things. 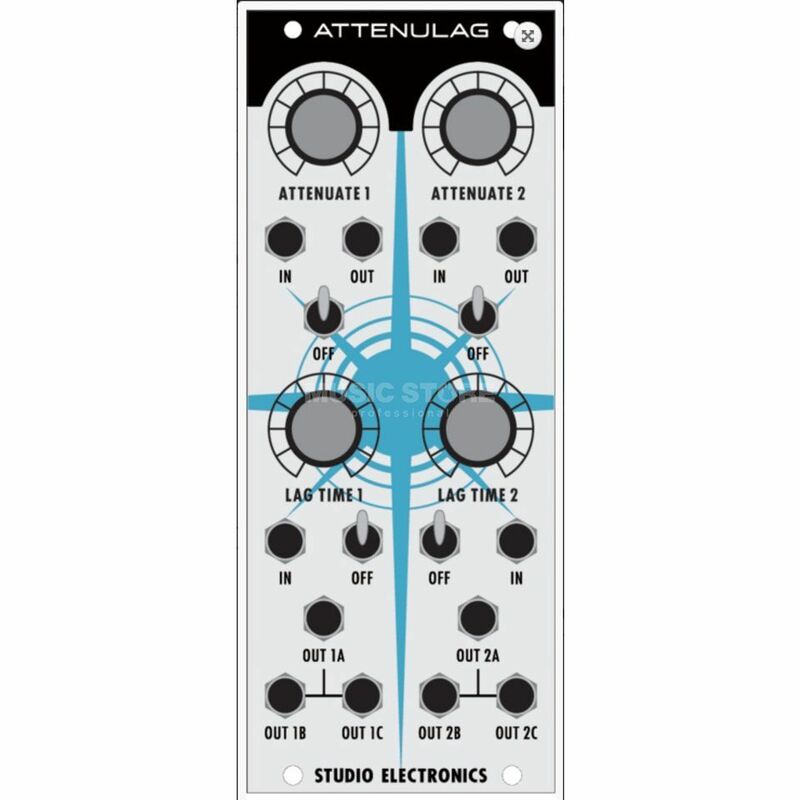 The two lag circuits provide a handy CV mult/hub for oscillator and filter tracking (perfect for CV-ing up our OSCILLATION module with its switchable one in/three out structure for both attenuation and slewing—x2) and are linked together: if you patch into channel 1 only, the outputs of both channels are driven (just like the attenuation circuit); patching into channel 2 breaks the link and they become two separate CV mult/lag circuits—envelopes look out. ATTENUATE 1, ATTENUATE 2, LAG TIME 1, LAG TIME 2. OFF: the top two handle attenuation duties; the bottom are wired to lag time. OFF – Bypass is in up position. LAG TIME – Exponential slewing amount—still affectionately called glide in some quarters. OUT A – Lag output A. OUT B – Lag output B. OUT C – Lag output C.